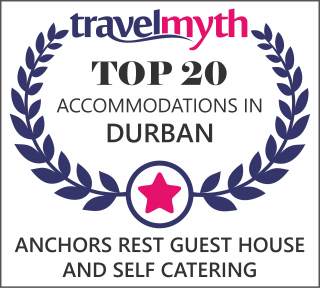 Each of the rooms at Anchor’s Rest has been individually decorated with great care to ensure a quality and relaxing experience for our guests. There are 3 large, superior rooms which can be taken either on a bed and breakfast basis or a self-catering basis and 1 double comfort room and 1 standard room which is taken on a bed and breakfast basis only. Children from the age of 10 years and upwards are welcome. Please view our Rooms below to get a unique view of the comfort and warm ambiance which awaits you. Large luxuriously appointed garden room with king size bed, en-suite bathroom and lounge area, The room opens onto a private patio, complete with sun loungers and barbecue. A well fitted kitchenette with self-catering facilities completes the picture. A honeymoon package for newlyweds is also available on request. Large, luxuriously appointed room with king size bed, modern en-suite bathroom and lounge area. The room opens onto a large sunny patio, complete with sun loungers, barbecue and electric sun awning. A well fitted kitchenette with excellent self-catering facilities make’s this the ideal room for those guests who want to relax and soak up the sun. This room is adjacent to the pool deck and faces towards the sea. The second of our luxuriously appointed garden rooms with king size bed, modern en-suite bathroom and lounge area. The room opens onto a large private patio complete with sun loungers, barbecue and outside entertainment area. A well fitted kitchenette with excellent self-catering facilities makes this very private room ideal for those guests who want to relax in a beautiful garden area. The Coral room overlooks our sparkling swimming pool and offers guests a large en-suite bathroom which has a separate shower and bath where you can soak off the cares of the day, or refresh yourself after a day of sun bathing or sight-seeing. There is a queen size bed with crisp cotton percale linen which ensures a luxurious, good night’s sleep. The veranda off the Coral room is ideal for relaxing or enjoying a sun downer – while gazing out to sea on a tropical evening. The Aloe room overlooks our sparkling swimming pool and has a very generous size modern en suite shower (no bath). There is a double size bed and crisp cotton percale linen which allows you to relax and unwind with a restful night’s sleep. The veranda off the Aloe room has the same relaxing outlook as the Coral room which is also our only “Standard Room” and is ideal for the business or holiday traveler who does not need the extra frills that the larger rooms offer. 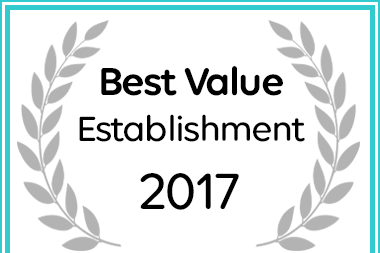 Afristay has named Anchor's Rest Guest House in Umhlanga a Best Value 2017 Establishment.